Lab 99 Web Design is based between Crawley and Horsham in West Sussex. Our international reputation has won us clients in France, Spain and the USA, as well as all over the UK. We create good–looking websites that rise high in the search engine rankings. Lab 99 Web Design in Crawley, Sussex, make stylish websites for small businesses, large companies, and non–profit organisations. Includes the first year’s domain name registration. Includes the first year’s hosting for your website. £399 for up to 4 pages. £499 for up to 10 pages. 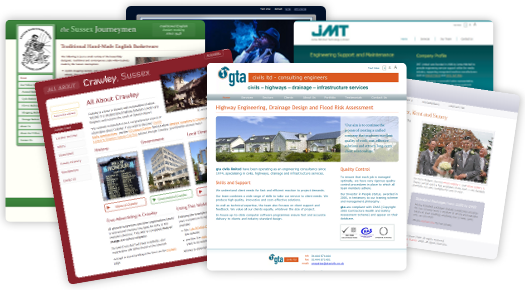 Online brochure websites to display your products and services. Database websites for more complex functionality. A unique, top–quality design to complement your brand. All the features you need — you don’t pay for features you don’t need. Fully accessible to your human visitors and every search engine. Sell online with integrated PayPal or Google Check–out. We create fully–equipped online shopping cart websites. Change the text on your website yourself. Upload pictures to your website. Increase your website’s search engine rankings. Freshen your website’s tired appearance. Give your old website a mobile–friendly layout. Get a free website health assessment. Search engine optimisation is built into all our websites. Domain names — we supply .com, .co.uk, and more. Web hosting, including unlimited email accounts. Custom HTML and CSS coding services. Internet marketing to keep your website in the spotlight. Web copy–writing and editing services. Pay–per–click advertising campaigns, such as Google Adwords. Help and advice at every stage of the process. and the most up–to–date CSS layout techniques. comply with all the relevant legislation, including the Disability Discrimination Act. Our Web Advice section will tell you all about the boring technical stuff. See our Accessibility section for details of our accessibility policy. Lab 99 Web Design is a small web design studio based in Pease Pottage, near Crawley in West Sussex. We are experts in HTML and CSS, and we have links to specialists in the fields of database programming and internet marketing. Lab 99 Web Design has acquired customers from all over the UK, and abroad. Because we are based between Crawley and Horsham, the majority of our web design work is for businesses in Crawley, Horsham and other parts of Sussex. We try to answer all genuine enquiries within 24 hours. A small business website will normally be up and running within one week of our receipt of all the relevant material, such as text, photographs, instructions, and any logo or layout artwork that you may wish to supply. More complex projects, such as e–commerce websites or custom coding work, will normally take a little longer. Once we know your precise requirements we will be able to provide a realistic timetable. We have produced a guide to help you plan your website. Here’s the question everyone asks us: How much does a website cost? Not sure if a website is necessary for your business? Discover six reasons why you need a website.